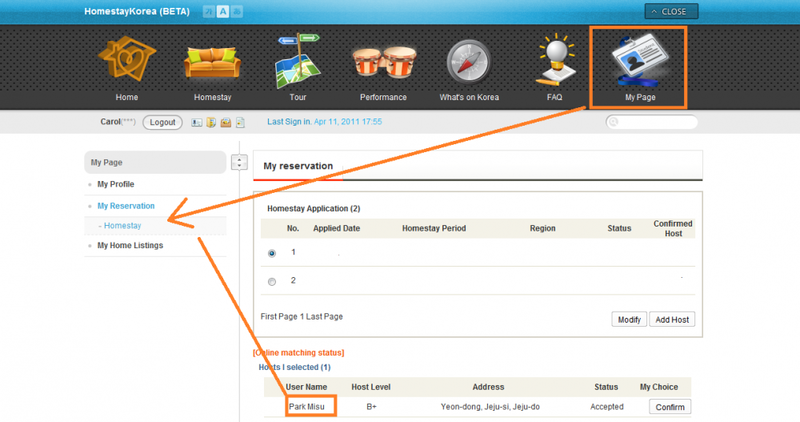 HomestayKorea ::: FAQ - For Guest - How do I confirm a host for homestay? How do I confirm a host for homestay? To confirm a host, go to your "My Page" and check your "My Reservation". On your reservation you can see any hosts who have accepted or invited you for homestay and see more detailed info on them by clicking on their name. After you have made your decision, you can confirm the host you want by clicking the confirm button under the "my choice" column. 25 OMS (Matching System) How do I change my scheduled dates for homestay? 24 Fee & Payment Can I pay in cash? 23 Homestay Application Okay, I've confirmed a host. What do I do next? 22 During Homestay Can I rent a mobile phone while I stay in Korea? 21 Homestay Application Some hosts haven't logged-in to the site in months...should I apply to them? 20 During Homestay Will my electronic devices (iPad/Laptop/Phone/etc.) work in Korea? 19 During Homestay What if I am unsatisfied with my host family? Homestay Application How do I confirm a host for homestay? 17 Homestay Application How can I check my application status? 16 Homestay Application How do I search for hosts? 15 Homestay Application How do I apply for homestay? 14 During Homestay What do I do after I arrive? 13 During Homestay Are there families that can prepare vegetarian meals? 12 During Homestay Can I cook my own meals? 11 During Homestay Is there someone I can contact if a problem arises? 10 Homestay Application Can I contact my host family before the arrival date? 9 Homestay Environment What kinds of families are there? 8 Fee & Payment Do you have a refund policy?